“We would like to inform you that on Saturday, August 13, 2016 over forty people were brutally killed around the City of Beni, North of Goma and many others seriously injured. Just like in the past, the method the assailants used is similar to that of Boko Haram or AI Shabab. The massacres occurred just a few days after President Kabila had visited the area and had had a meeting with the President of Uganda concerning Ugandan Rebels of the Allied Democratie Forces (ADF) who generally are held responsible for repeated massacres in the area of Beni, at the border with Uganda since October 2015. Until now, over thousand people have been killed but neither the Congolese Government, nor representatives of the United Nations based in the country have been able to give credible explanations why both the National Army and the UN troops have not succeeded to neutralize the perpetrators of those massacres. But some analysts within the country and from outside are of the opinion that Ugandan rebels are not the only authors of these massacres, but that sorne officers of the Congolese army also share the blame. 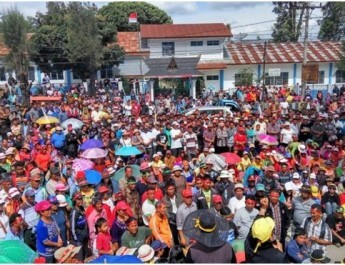 ln fact, a recent investigation done by an American organization, indicated that some officers from former rebel movements, who were later integrated in the National Army, have been cited among the perpetrators of killings in the area of Beni. CBCA has called for political and financial support, but we also ask you to pray for the church in the midst of these conflicts, and for all the victims and their families. Let us pray that God will bring peace to this troubled region! Copyright © 2019 Batak Karo Protestant Church [GBKP]. Theme: ColorNews by ThemeGrill. Powered by WordPress.